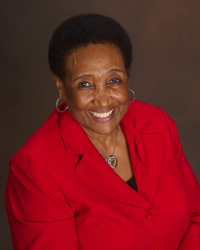 Mattie P. Sanders is currently retired from the Director of Counseling position at Berkeley Middle School in Moncks Corner, South Carolina. Before becoming a Guidance Counselor, Mrs. Sanders taught in Charleston, South Carolina and Washington, DC. She is known as an outstanding educator, committed and loving Guidance Counselor, dynamic presenter of Guidance and Counseling topics, a community servant and a collector of African American Artifacts and memorabilia. Mrs. Sanders’ college education was started at Johnson C. Smith University in Charlotte, North Carolina where she pursued a major in English with a minor in Psychology. At JCSU, she was a member of the University Post Office staff and was selected as “Miss University Post Office.” She was a member of the Pyramid Club and was initiated into Gamma Lambda Chapter of Delta Sigma Theta Sorority, Inc. During the 1965-1966 School Year, she served as Secretary of the Golden Bull’s Staff and was also a member of the Publicity Committee. Mrs. Sanders withdrew from JCSU during the 1966-1967 School Year to relocate to Washington, DC where she enrolled in Howard University and continued her education. Mrs. Sanders received her B.A. Degree from Howard University in Washington, DC and a M.Ed. Degree from The Citadel, The Military College of South Carolina. She is married and has two daughters. Sanders is the recipient of numerous recognitions and awards including several outstanding Counseling Awards, three time Counselor-of-the-Year for the Tri-County Area given by the Tri-County Counseling Association, finalist for Charleston County’s Teacher-of-the-Year and State Guidance Counselor of-the-Year given by The South Carolina Counseling Association. She has presented at conferences of The South Carolina Association of School Administrators and The South Carolina Counseling Association. She presents on such topics as “Saving Our Black Males,” “Advertising Your School-A Public Relations Workshop,” “How to Put Creativity in Your Counseling,” and various other topics pertinent to her professional role. Mrs. Sanders ran a mentoring program at her school entitled, “The Lunch Buddy Program.” The program targeted at-risk students and afforded them a chance to eat lunch and chat with professionals from area businesses. After lunch, the students and volunteers were engaged in various activities. During the 1999-2000 School Year the number of volunteers numbered seventy-seven. The companies were Santee Cooper, Gates Rubber Company and Berkeley Electric Cooperatives. Mrs. Sanders nominated these three companies for a South Carolina State Department of Education’s Community Service Award and each business won in separate years. A considerable portion of Mrs. Sanders’ time is spent collecting, organizing and presenting educational programs on the African American Experience. She is the Executive Director of B. R. I. G. H. T. (Blacks Righting Injustices and Gaining High Triumphs) Historical Organization, Inc. The Organization is non-profit and supports “Black Footprints: Blacks-Past and Present” which is a private collection owned by Ms. Sanders. Using the collected items, she presents at schools, colleges, churches, community centers and boy’s and girl’s clubs.